Whether it’s simply a ball, athletic shoes, or an entire set of protective gear, each sport has its own requirements. As the parent of a young child starting out in sports, you may wonder how much (and when) you should invest in equipment. Providing individual or group lessons for your child is another decision you may face. Some organized youth sports such as soccer, basketball, and flag football require little in the way of equipment expense. A good pair of shoes and ball will enable any child to play, practice, and explore their passion for the sport. Likewise, baseball and softball only require a glove and ball. (Someone else probably has a bat that everyone can use.) These team sports are usually well supported within a community and your child should have easy access to developmental leagues and skill clinics. Other team sports such as hockey, lacrosse and tackle football usually require a larger investment in equipment. Likewise, “club” sports teams may require that you pay substantial participation fees. In some cases, though, the cost is defrayed (often through fundraisers) by the youth sport organization itself. Individual sports such as golf, tennis, and skiing not only have an equipment expense but may also require that you invest in lessons for your child. Access to free instruction in these sports is usually more limited than youth team sports. While introductory lessons may not cost much, year-around lessons for a child who shows the potential to become an elite athlete can run into the thousands of dollars. If you are strapped for money and unsure whether it makes sense to buy certain equipment or invest in lessons, pay close attention to your child’s behavior. Look for signs that he or she has a natural interest or fascination for a sport. If you see your child playing with other kids, practicing on their own, making up fantasy game situations, and using everyday objects as a ball, bat or other piece of sports equipment, it’s likely that your child has a serious interest in the sport. Consider buying the crucial piece of equipment (e.g., hockey skates, lacrosse stick) that will enable your child to further explore the sport. Good used equipment is often available from parents whose kids outgrow or upgrade their equipment (i.e., network with other parents). Obtaining the right equipment and instruction sometimes determines whether your child likes a sport or instead feels inadequate. Worn out basketball shoes, dull hockey skates that provide no ankle support, a tennis racquet that is too heavy, are examples of equipment that may hurt a child’s ability to compete and enjoy the respective sport. The cost of equipment is not as important as the proper fit and match with your child’s size, strength, and ability. I’ve seen a good tennis player succeed with a ten dollar racquet that had a weight and grip size that fit the player. I’ve also seen boys and girls struggle on the basketball court because they are wearing the wrong type of athletic shoe (e.g., running shoe) or ones having worn out bottoms that can’t grip the wood floor. Should You Invest in Personal Lessons? As to lessons, your goal is to find an instructor who is first and foremost an excellent teacher. Playing a sport well does not mean that an individual can effectively communicate their knowledge to another person. Just as you should match the appropriate equipment to your child’s ability, find an instructor who teaches skills at the level needed by your child. 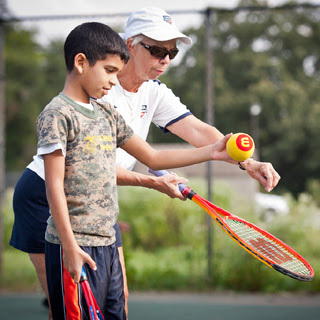 If your child is a beginner, you want someone who understands and teaches the sport’s fundamental skills. As your child progresses, you may need to find an instructor who can better teach advanced skills. Finally, if you cannot afford ongoing lessons, consider an initial lesson or two from a good instructor to set your child on the correct path. A friend of mine told me a story that touches on a parent’s decision to invest in equipment and lessons for their child. One of the local tennis clubs was offering a free instructional clinic for young children in an attempt to increase interest in the sport. The mother of a young boy named Todd decided that this would be a good opportunity to expose her son to the sport of tennis. Todd, who was very small for his age (and had difficulty competing in other sports), had never before played tennis. With a racquet provided by the club, the boy began to hit and did very well. After the session, the mother talked to the instructor and asked him what he thought about her boy’s potential. He said that he was honestly impressed with Todd’s initial level of play. The instructor recommended that the mother invest in a racquet and then watch how the boy responded. The mother bought a racquet and eventually decided to also invest in individual lessons. Todd’s skills developed over the years, his passion remained steadfast, and he enjoyed a successful high school career—one that culminated in a state singles championship. Parents in all sports should follow a similar path. Expose your child to different sports whenever possible and provide basic, well fitted equipment. Observe the level of interest. If your son or daughter takes to the sport, consider purchasing additional equipment if necessary and investing in lessons where possible. For more on selecting and buying equipment, check out Sports Gear: Sometimes it’s Worth the Extra Spend, Sometimes it’s Not. There is no need to buy brand new gear the first time your child tests out a sport either. Borrow from friends and scout out second-hand shops. Some of that gear may only be a season old. Just make sure everything fits properly!